FREE valuations on maundy sets for 'insurance' or 'sale' purposes. This site has been created to give information regarding the history of maundy money. We have included a section ............... Did You Know? This details any unusual aspects relating to "maundy" generally. Please email with any additions for this section. Do you have a maundy story to tell? Any contributions will show the source of the information received in the acknowledgments section. There are a number of books on the subject of maundy and details are shown in the publications section of this website. If you are aware of any further articles or books on this subject then we would appreciate if you could let us know. We would very much like to hear from anyone who has attended the maundy ceremony. Your stories and photographs would be welcomed. Included in this site are links to other useful maundy sites. Do you know of any others? We would welcome any suggestions or additional content for this website. 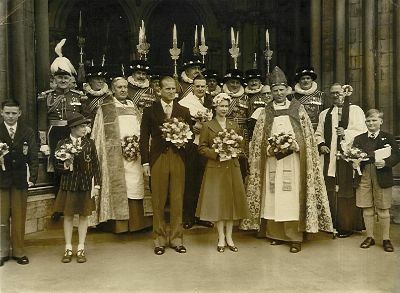 Queen Elizabeth II and The Duke Of Edinburgh at the maundy service held on the 18th April 1957 at St Albans Abbey, Hertfordshire. Original Photograph.